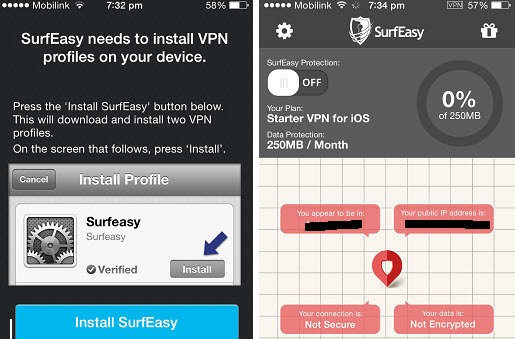 List of best free Virtual Private Network (VPN) apps for iPhone. VPN is a one of the best way to surf internet safely and securely. Using the VPN apps, you can access any website, videos, movies, social networks and apps that not available for your country. feature. So save your mobile 3G or 4G bandwidth. most popular news websites like CNN and USA Today. turned on. If you are using old version of the iOS like iOS 7, you need to enable “Always on – Astrill VPN” option in Settings -> VPN (VPN profile settings). Most famous VPN service. Its have a free version. But that version only offer VPN protection for few days. You can use 3 different country based IP address from USA, UK and Japan. Use online resources any time and anywhere using VPN unlimited app. It have a trial and subscription version. Get free bandwidth by inviting your friends. Its available for most of the operating systems like Windows, Android, iOS and Mac. This app is the best one for who wants country specific IP address. This apps required user registration. That’s why are putting this app in last position. After you registered an account it will provide 300 MB free bandwidth. If you knew any other free VPN services for iPhone or iPad, do let us via comment. i am not sure that free vpn is the right way of connect your data, because free vpn is not as much secure as paid vpn however astrill and express both are offering a very good free trail that really encourage you to buy however if you willing to avail a latest a free vpn in a single vpn payment then i will suggest you to brows the following link.